Same on my newest tile. It looks like gold, maybe it glitters a bit too much, but its ink. I used Winsor &Newton Gold-Metallic Bronze Ink and a tiny paintbrush to color the orbs. First I wanted to color them with colored pencils and shade them like gemstones, but I didn't like the test orbs on a seperate piece of paper. I bought the gold ink weeks (months?) ago and wanted to do a tile with it since then... The tangle pattern I used was really simple. Its called "Lollywimple" and I combined it with one of my alltime favourites: "Flux"
I dont have a "without shadow" picture this time, because I started this tile at school and did most of shading there too. I'm sorry. Maybe next time! Alle hier gezeigten Bilder und Grafiken wurden von mir (Christina Wenzel) erstellt/gezeichnet, außer es steht eine andere Quelle dabei. Eine Verwendung ist nur in Absprache mit mir gestattet! 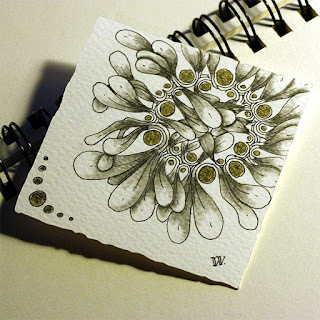 Zentangle® by Rick Roberts and Maria Thomas. Design "Einfach". Powered by Blogger.